Attention: For information on configuring the Integrated Checkout feature for the mobile application, please refer to the following topic. This feature can be enabled after completing the steps described in this topic. Planning This status occurs when the activity is being planned (either in the ERP system or in the Workforce Management app). Dispatching This status occurs after a service call has been recorded and is available to released as an activity in the Workforce Management app. Execution This status occurs when an activity is being worked on by a technician. Closed This activity occurs after the activity has been completed and checked out. Accept/Reject After an assignment has been released from the Workforce Management app, the assignment will receive a workflow step status of "New". From the Assignment Detail screen, the technician will then be able to accept or reject it from the Activity Details screen. If the activty is accepted, the status will change to "Execution". If it is rejected, it will be change to "Dispatching" where it can then be re-released from the Workforce Management app. Break When a technician takes a work break, the activity status will change to "On Hold". After the break, the technician can select "Resume" from the Activity Detail screen to change the activity status back to "Execution". Cancellation If the activity has been accepted but later cancelled, the activity will now have a "cancelled" status. It can then be re-dispatched in the Workforce Management module. Hand Over/Take it Alternative to cancelling an accepted activity, technicians can also "hand over" an activity to another technician for completion. A technician can takeover/accept an assignment by selecting the "Take It" option. From the Admin module, select the Companies option from the top pane. Select the Company from the list for which you would like to enable Workflow Step functionality. Select the Settings option from the left. 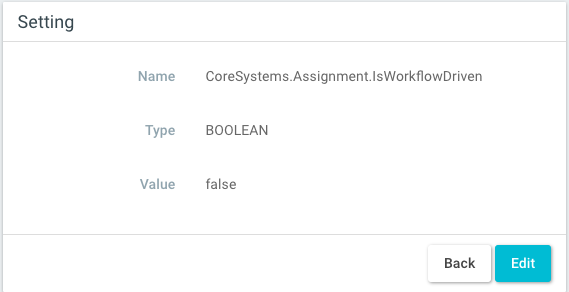 Search for an select the CoreSystems.Assignment.IsWorkflowDriven company setting. Value When False, the workflow step functionality will NOT be enabled for the company. 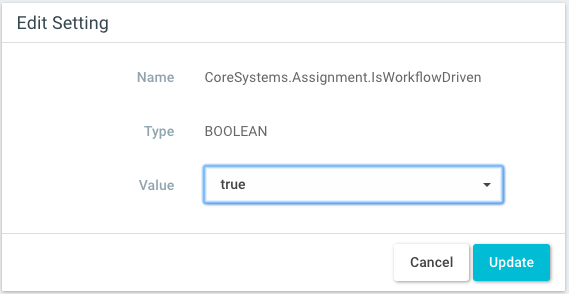 When True, the workflow step functionality will be enabled, and technicians will be able to change assignment status in the Assignment Detail screen of the mobile application. Change the value from False to True and select update below. The application will then display a "Setting Updated" message. 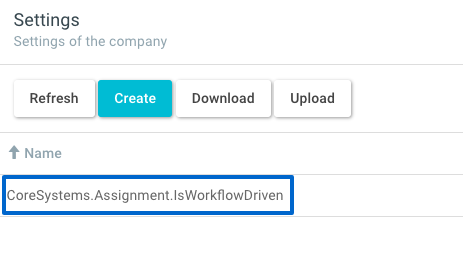 In the Assignments List, the current workflow step is displayed and highlighted beside the assignment. However, for “new” assignments that have not yet been accepted, no status information will be displayed. The current assignment workflow step of the assignment is displayed in the Assignment Detail screen. Workflow steps that follow the current workflow steps are displayed at the bottom of the screen. From this screen, the technician can proceed through the assignment workflow steps until checking out and bringing the assignment to a close. The Accept/Reject workflow steps allows technicians to reject an assignment if they are unable to respond to it or complete at the scheduled time. By accepting the assignment, the assignment status will changed from “Released” to “Accepted”. By rejecting the assignment, the assignment status will change from “Released” to “Rejected” and the assignment can then be assigned to another technician from the Workorce Management screen. Please note that the Reject button is located in the menu. The Cancellation option allows a technician to cancel an accepted assignment if they are no longer able to respond to it or complete it. By cancelling the assignment, the assignment status will change from “Release” to “Cancelled”. The cancelled assignment will then receive an “In Planning” status so that it can be assigned to another technician from the Workorce Management screen. Note: This option is available only if the technician has UPDATE permissions on Assignments and can READ (view) for Employees and Checklists. For more information on permission settings, refer to the following topic. The Hand Over/Take it function allows technicians to “hand over” assignments that they have accepted to another technician, and for technicians to “take” or accept the assignments that have been handed over to them by other technicians. The “handover/take it” functionality is available from the function menu in the Activities screen. When, a technician selects the handover option, they can then select and assign the activity to another technician. 1. Login to the application, make sure you have all required permissions and sync. 2. Select a non-closed Activity and select Handover from the option menu. 3. Select a responsible from the list. 5. The responsible for the Activity will now be the one selected from the responsible list of values. 1. Login to the application and click the sync button. 2. Select a non-closed Activity and select “Take it” from the option menu. 3. Click OK in the new message dialog. 4. Your will be now set as responsible and the sync button will be red, indicating unsynced data. The Break function creates a new status when a technician selects the break option: “on hold”. This status is displayed in the Assignment Detail screen until the activity is “resumed”. This is done by selecting the “Resume” option from the Assignment Detail screen. While the technician is on break, the duration is recorded in the background until the technician resumes the assignment. When the break timer is stopped and the assignment is resumed, the recorded break time is created as an effort and displayed to the technician.